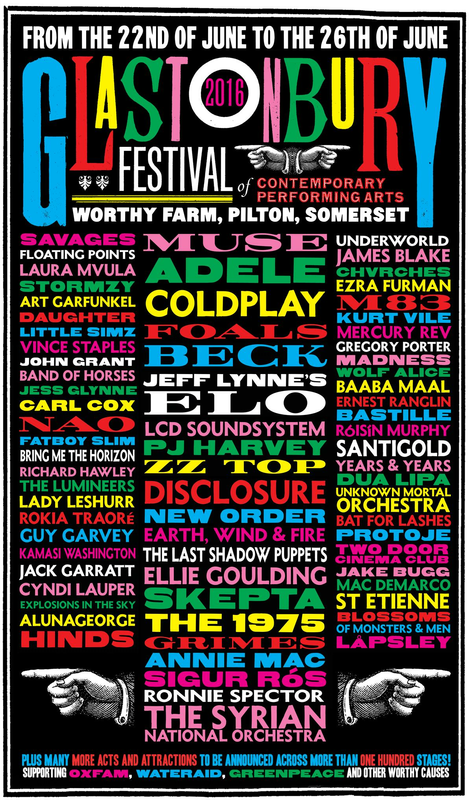 Noel Gallagher claims that the Glastonbury 2016 line-up “isn’t exactly great”. Discussion about the pros and cons of the bill at the UK’s biggest festival will endlessly rage on regardless. Here at Radio X we’ve dipped into the acts that are confirmed to play Worthy Farm between 22 and 26 June… minus the headliners. Something should float your boat here? Yannis and co are now a festival headliner in their own right and their latest album What Went Down is full of epic tunes. Also: My Number. The ultimate summer song? He’s got a back catalogue of brilliant, memorable songs and recent setlists have seen him playing ALL the hits. So make this a must-see set if you’re going. James Murphy broke up the band a few years back, but he changed his mind and his dance-rock project is back on the road. Earlier this week, he unleashed a set in Calfornia that included Losing My Edge, Daft Punk Is Playing At My House and the classic Losing My Edge. Essential. She’s back. One of our greatest national treasures has returned with a new album, The Hope Six Demoltion Project. It’ll be an intense, serious set, so hang up your dancing shoes for half an hour and watch a brilliant artist perform on a stage where she’s utterly at home. 2015’s Music Complete saw the Mancunian legends get a new lease of life and their live show is the best it’s ever been. Their Glastonbury appearance in 2005 was a bit hit and miss, but this will be slick and danceable, with such big tunes as Blue Monday, Bizarre Love Triangle and a couple of Joy Division songs for good measure. Will they play World In Motion? Time will tell. Alex Turner and Miles Kane have revived their side project and the new LP, Everything You’ve Come To Expect, is getting good reviews. It’s a lavish, cinematic record and self-indulgent in a great way. Glastonbury will go bonkers for them. Matt Healy’s crew are one of the UK’s biggest bands right now and their glossy mix of indie rock and classic pop riffs is ideal for a sunny day (weather permitting). The BRITs love him, we love him. He’s a singer-songwriter who dips into James Blake-esque electronica and will be massive this time next year. So don’t miss out. Mining a similar vein as Jack Garratt, Holly Lapsley Fletcher released her debut album Long Way Home earlier this year and is another name to keep an eye on for the future. Her live show is excellent, so make a beeline if you can. Pure, epic Glaswegian synth-pop fronted by the always-superb Lauren Mayberry. Their new album Every Open Eye translates very nicely to being performed live, so get involved. Playing the “Sunday Legends” set this year are Jeff Lynne’s revival of his Electric Light Orchestra project. There’s so much more to them than Mr Blue Sky, so it’s worth stopping by for a lesson in how to do orchestral pop. The awesome Ellie Rowsell fronts this London rock band with a pop edge, and a couple of years’ worth of touring has honed their live show. They are going to OWN Glastonbury this year. The Club has begun active operation again in the last few days, so the time is right to hear what’s in store from the long-awaited follow-up to 2012’s Beacon album. The Buggmeister will drop his third album On My One a week before Glastonbury, and the preview single Gimme The Love indicates that it’s going to be a stormer. Plus, you shouldn’t miss his no-nonsense set of great tracks like What Doesn’t Kill You and Lightning Bolt. Stockport’s finest head to Glastonbury and you should give one of the North West’s most accomplished new bands a look. They’re due for big things, be prepared to impress your friends in the future with tales of how you saw them “back in the day”. ELO may be the Sunday Legends, but the veteran boogie-masters from Texas are also performing this year. Gimme All Your Lovin’, Sharp Dressed Man, Legs… ludicrously big riffs, fronted by ludicrously big beards. And they were in Back To The Future III, remember.